Elaborate home spas with wet rooms are designed to pamper the owners. Showers have been pushed out into elaborate wet rooms complete with floor designs, seating, shelving, windows, steam and ventilation in addition to multi-functional features. The desire to create the effect of a luxury spa at home has reworked shower design thinking well beyond the old tile and curtain format, especially in the last five years. Sea blue Waterworks Architectonics tile and Aquarius stone mosaic floor gives this his-and-her Peter Dunham shower [top] a hefty helping of Hollywood glitz. 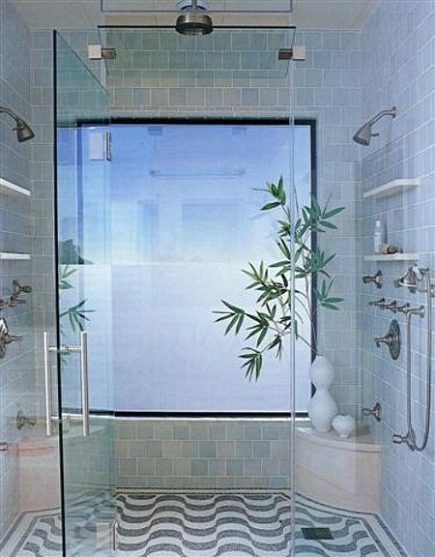 Within the frameless glass room, are four shower options. A rain showerhead dominates the center and serves as a rinse-off when the steam is used (note the telltale vent over the door). Each “station” boasts its own shower head, body sprays and thermostatic valve but only one user requires a hand spray. More of an area than an enclosure, this super-sleek modernist shower has a window and a view. 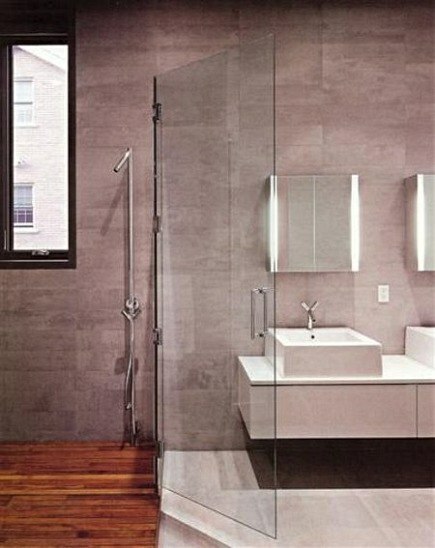 Philippe Starck Axor Hansgrohe fixtues add the hipster kiss of approval. With pared down water features, cement-colored walls and an exotic-wood-slat floor comes Zen like simplicity that says young and cool. 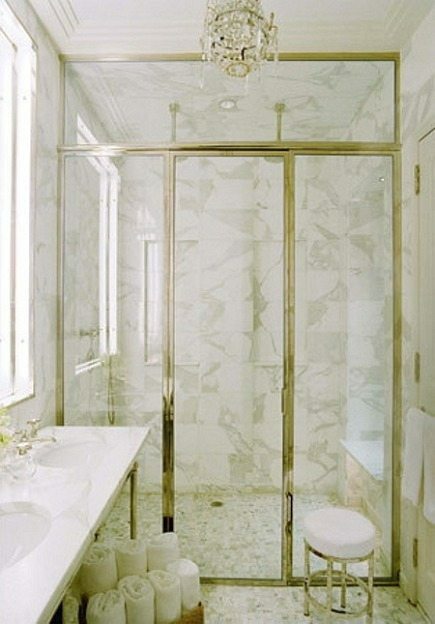 Polished marble tiles and a gold-tone frame produce a haute hotel look for this shower by New York design team Nathan Egan. It’s hard to make out but there are twin rain shower heads in the center plus a hand shower on the left wall, opposite a window with a bench below.